Mayan. Might end. How often do you get to do an apocalyptic pun? Supposedly, the Mayan Long Count Calendar predicts the world will end today, December 21, 2012. Experts have debunked the idea, and even present-day Mayans don’t believe it, but the media loves the hype, and so do cartoonists. If you google “Mayan calendar,” you’ll find images like the ones below. Left: the Aztec Calendar Stone, also known as the Aztec Sun Stone. 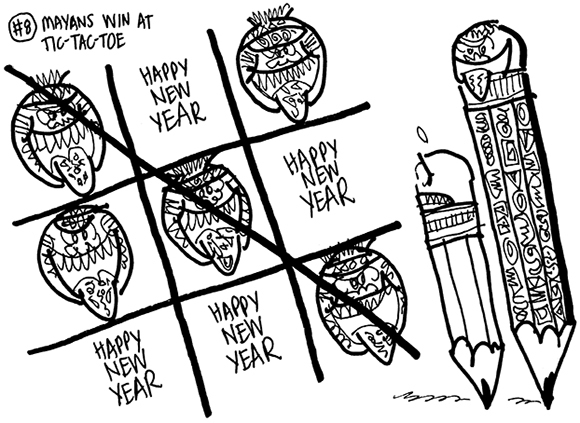 The Aztecs came after the Mayans and adopted their calendar. Right: folk art based on the Aztec Calendar Stone. I based my own little Mayan characters on the above folk art. Here’s a detail image. If it looks a bit ragged, it’s because it’s just a souped-up rough sketch. 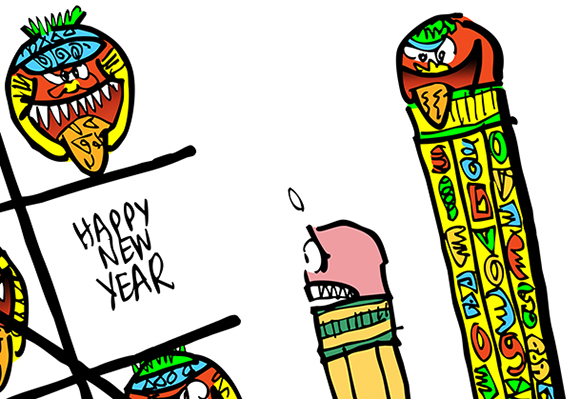 I’m working on a New Year’s card for a client, and the gag line will be, “The Mayans were wrong– Happy New Year!” This was one of my ideas. I just cleaned it up a little and added some color. Here’s the original sketch. It seems doubtful the world will end today, which may be a letdown for some people. But look on the bright side: the dire predictions inspired a lot of humor. I’ll leave you with a couple of very funny gags by cartoonist Dan Piraro. What do you think? Have you been putting off your Christmas shopping– you know, just in case? I’d never heard of the Mayan Calendar until recently– had you? 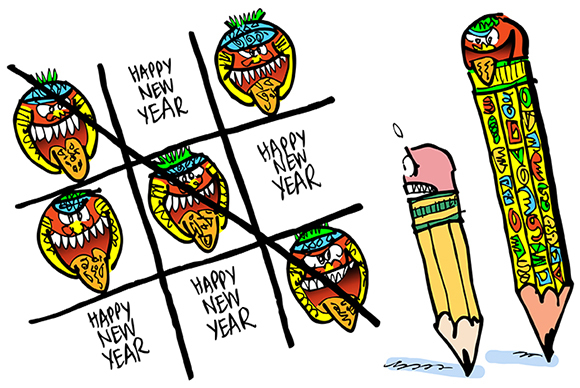 Ever played tic-tac-toe for really high stakes?? Hope you’ll leave a comment. Love your illustrations, Mark. “The World Mayan Today” – is a great pun. Many knew the Mayan prediction of the world’s end – again – couldn’t be true because Marty McFly of “Back to the Future” traveled to 2015. Sad to say, some did take these predictions seriously. I think I did read somewhere that there’d been a movie about the Mayan Calendar. If so, I’m glad I missed it! I always love the minute details in your illustrations. The details in the Mayan Pencil is amazing ! You should have had your Mayan pencils made so folks could purchase. So cute and colorful! Just what the end of the world needs:-) One of my friends said their office had a Doomsday party. So glad everyone got into the spirit of it, especially you Mark! No worries for us, though– we’re survivors! Cheers, Tracey! This is a brilliant cartoon series. I loved it and I tweeted it. The Mayan’s did not claim the world would end they claimed only it was the end of an epoch. it’s the Jehovah’s Witnesses who have produced the all time record for predicting the end of the word as we know it. I love, love this 🙂 It’s 23rd of December now, so the world keeps evolving still… Yiheyyyyy!!! The 21st was my folks’ anniversary. I am ready for Christmas in two days. Merry Christmas to you too, Mark. Thanks, Jason, I really appreciate your stopping by, and I’m sorry to be late responding to your very kind comment. Thanks for the wonderful comment, Linda. 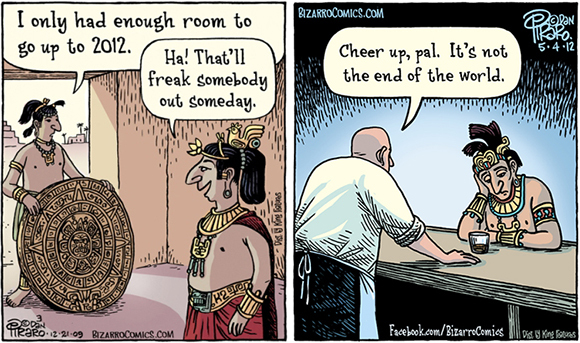 Your humor is more than a match for any Mayan calendar– ZAP! And your new Mayan-with-tongue-sticking-out emoticon is going to be huge– it perfectly sums up so much of what one sees on the internet!! Yes, and since the world didn’t come to an end on December 21st, all those Mayan-inspired fashions are currently on sale!! I’m going to confidently predict that you’ll be picking up a number of those outfits, and that you’ll be doing an exciting post about same in your blog– and I know you’ll look stunning! !